Learn how to carve and present your potatoes in a fantastic fondant style in this flavoursome fish recipe. There's also a crash course in how to knock up a delicious beurre blanc sauce. Put in a saucepan and half cover with stock and butter, season well then bring to the boil, reduce to a simmer and cook for thirty minutes, basting every now and then and turning over after 20 minutes. Make the beurre blanc by putting the shallots and vinegar into a pan and reducing the vinegar by half. Strain to remove the shallots but keep the vinegar. Return the vinegar to the pan and whisk in the cubes of butter until you have a smooth, shiny emulsion and keep warm, being careful to not let it get hot and split while you whisk. Fill another saucepan with water, wine, the aromatics and peppercorns and bring to the boil. Reduce the heat, gently add the salmon then poach at a very gentle simmer for three minutes. Turn off the heat and leave until ready to serve. 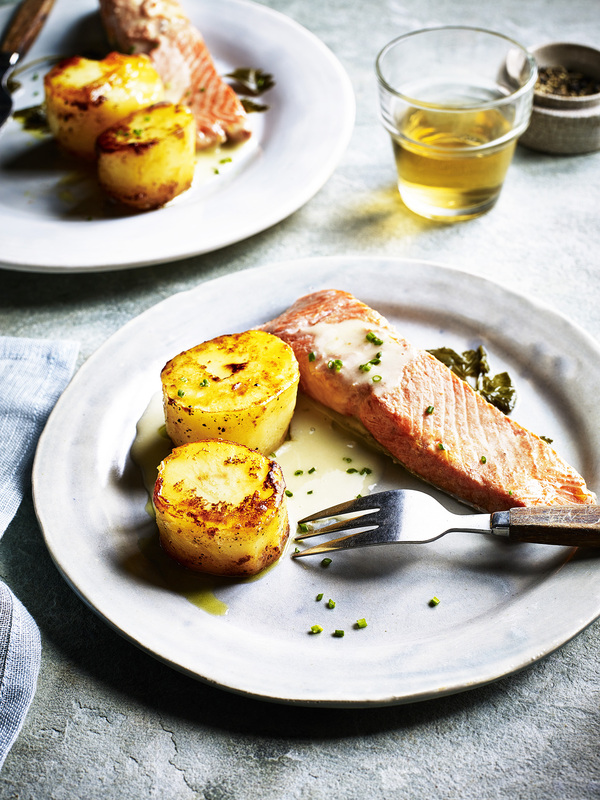 Serve the salmon with the potatoes, beurre blanc and chives.